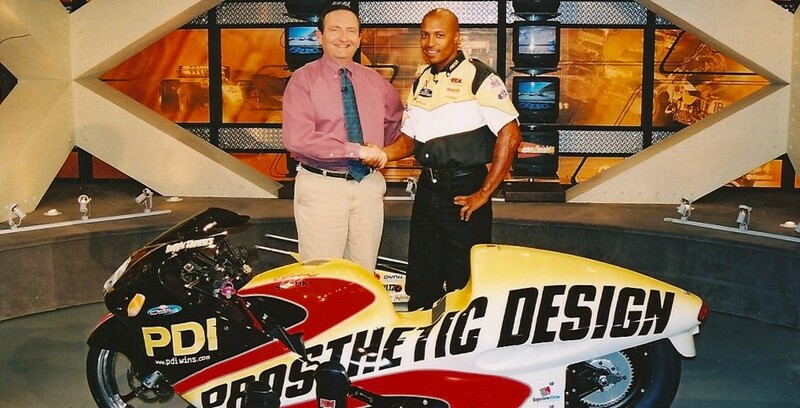 Enjoy a look back at one of the most inspirational men in not only motorcycle drag racing, but in all of sports, Reggie Showers, the world’s fastest amputee. Showers may have taken a break from racing, but as most can relate, the passion for the sport never fades. 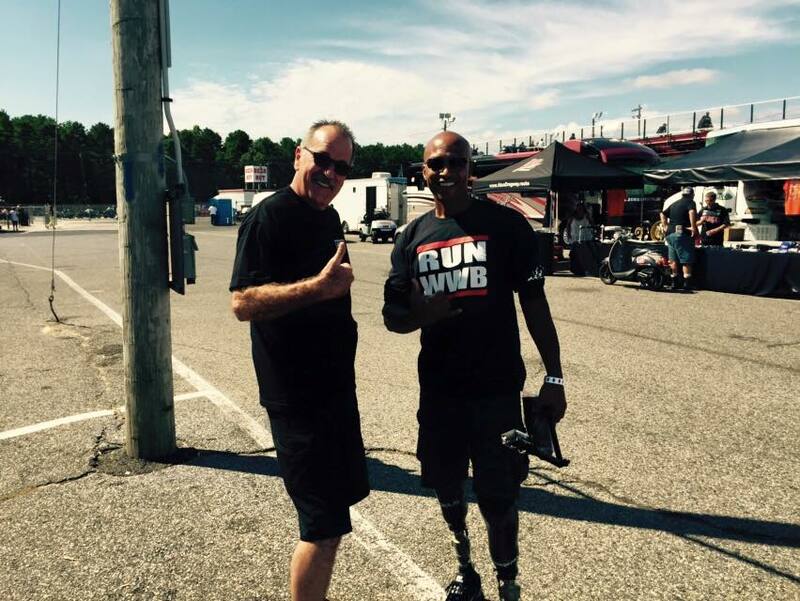 Showers showed up to his hometown event, the IDBL Orient Express U.S. Nationals in Atco, NJ in Sept. 2015 to relive some of the glory days and visit old friends. “Racing is in my heart. It’s what I was born to do,” Showers said. Showers, who prides himself on helping and motivating others, seemed to be in the right place at the right time to come to the aid of one of his longtime racing buddies. Showers was a tremendous help to Larry “Spiderman” McBride after the legendary Top Fuel racer’s motorcycle burst into flames, sending him to the hospital with burns to his legs. 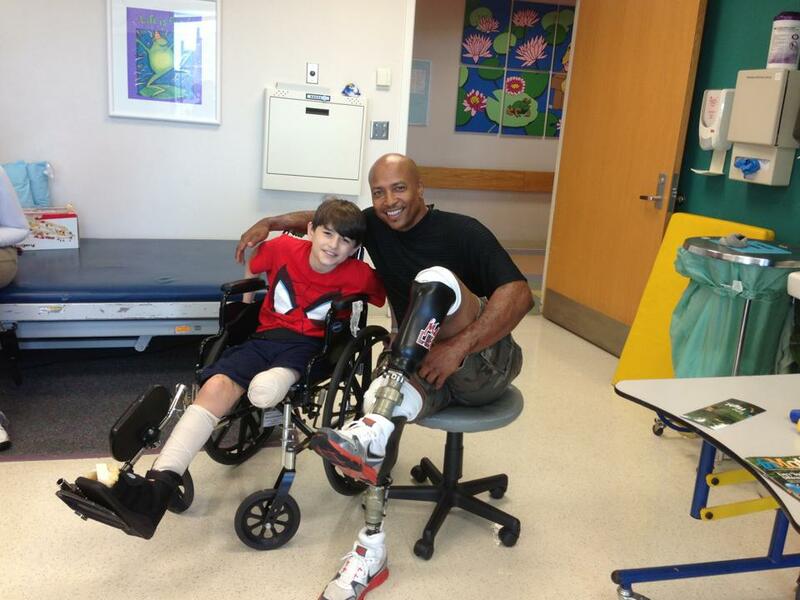 NHRA U.S. Nationals winner Showers graciously offered to pick McBride up from the hospital and gave the Spiderman the motivational talk he needed. Driving back with Showers, a double-amputee who lost his legs in an electrical accident, gave McBride an even more vivid picture of just how lucky he was to leave the hospital with only bandages on his legs. 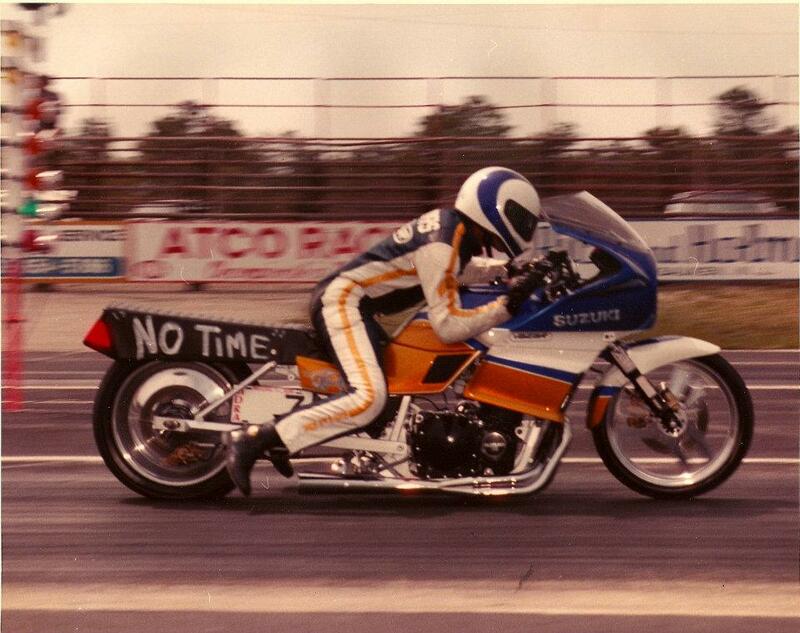 Enjoy now the story of how Showers made his mark in motorcycle drag racing. 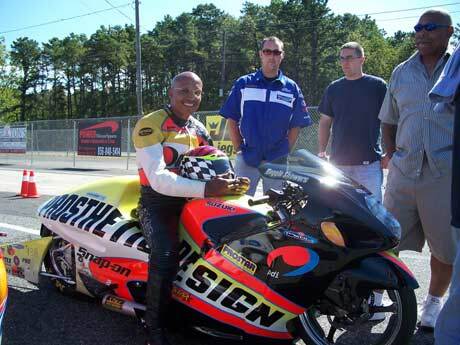 Imagine the exhilaration of piloting a 300 horsepower Pro Stock Suzuki Hayabusa down the quarter-mile to low seven second elapsed-times at around 200 mph. Pretty intense, huh? Now try to imagine that you don’t have legs. Still want to take the ride? 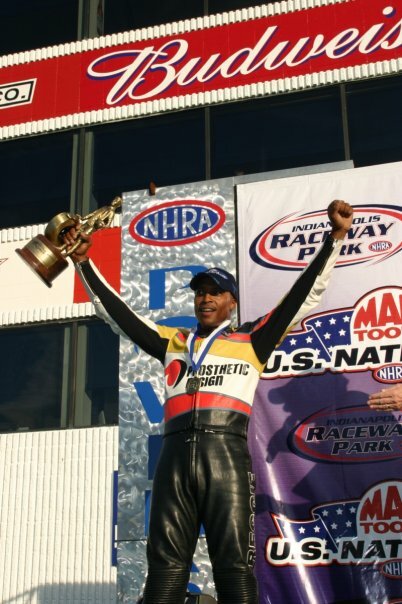 This unthinkable act had always been just another day at the races for former Pro Stock Motorcycle drag racer and double-amputee Reggie Showers. 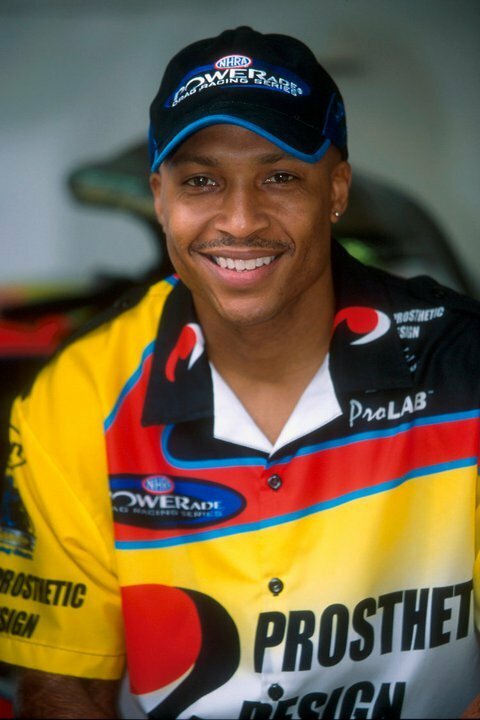 There are hundreds of awe-inspiring success stories out there about racers overcoming hardship and misfortune along the road to success, but it’s tough to top that of Showers, who overcame his disability and battled 20 years to obtain an ultimate triumph in the sport – an NHRA national event victory. 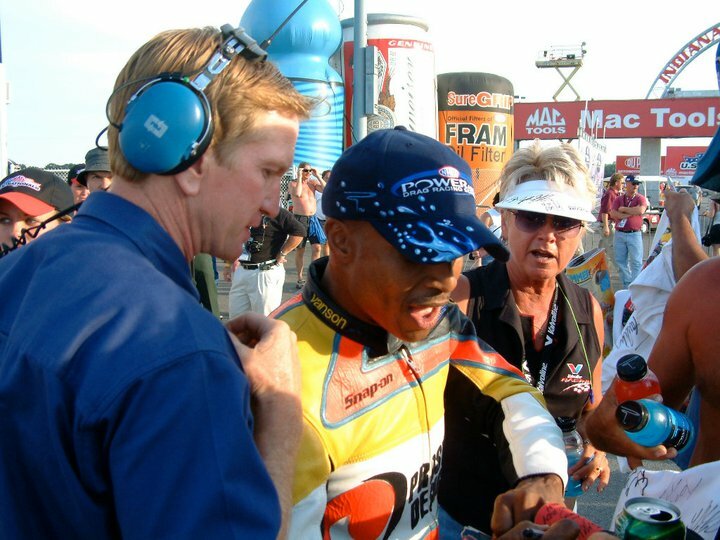 Reggie Showers and Larry McBride at Atco in 2015 – just hours before McBride would suffer a career altering explosion. Showers’ adversity began at age 14 when an electrical accident changed his life forever. As a child Showers spent most of his time riding his Honda 75 at a neighborhood dirt bike track. One day Showers’ motorcycle was broken so he rode his bicycle to the track and ended up playing in the box cars in the adjacent railroad yard. Showers got too close to one of the wires used to power the train and 13,000 volts of electricity surged through his body. Showers was instantly knocked unconscious. He sustained severe third degree burns and doctors were forced to amputate both of his legs below the knees. Determined to not let his disability get in the way of his dreams, strong willed Showers embarked on a motorcycle drag racing career in 1983. Showers, born and raised in Philadelphia, Pa., began racing street bikes at a local drag strip just over the New Jersey state, Atco Raceway. With the help of two prosthetic legs and hours of practice Showers gained enough range of motion to fulfill the necessary functions required to propel his motorcycle down a quarter-mile drag strip. Initially Showers disguised his fabricated legs and didn’t want people to know he was disabled. Reggie Showers and the late, great John Myers. In 1989 Showers began his professional career competing in the Pro Comp category in a minor league type organization called the IDBA. Showers was an immediate achiever on the circuit and captured both the season championship and rookie of the year award. Despite the instant success Showers remained levelheaded and modest. 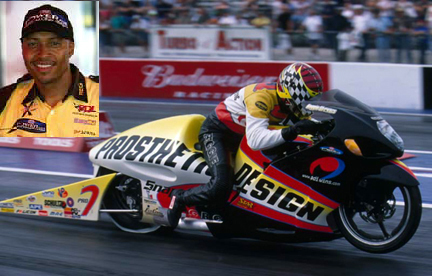 In 1995 a starry eyed Showers attended an NHRA national event in Englishtown, NJ, and dreamed of the day in which he could compete among the nation’s best riders in motorcycle drag racing’s highest level of professionalism and prestige. “I just remember watching on from the stands, wishing someday I could be there,” Showers said. Showers dream came true much sooner than he ever thought. 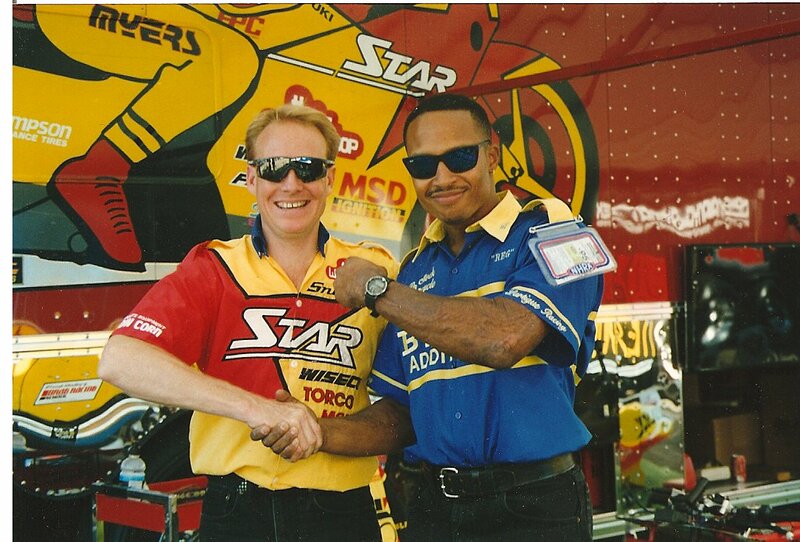 At the end of the event Pro Stock standout and good friend of Showers “Pizza” John Mafaro introduced Showers to Harry Lartigue, an established team owner looking for a rider. Showers and Lartigue instantly developed a strong connection and decided to team up for the remainder of the 1995 season. 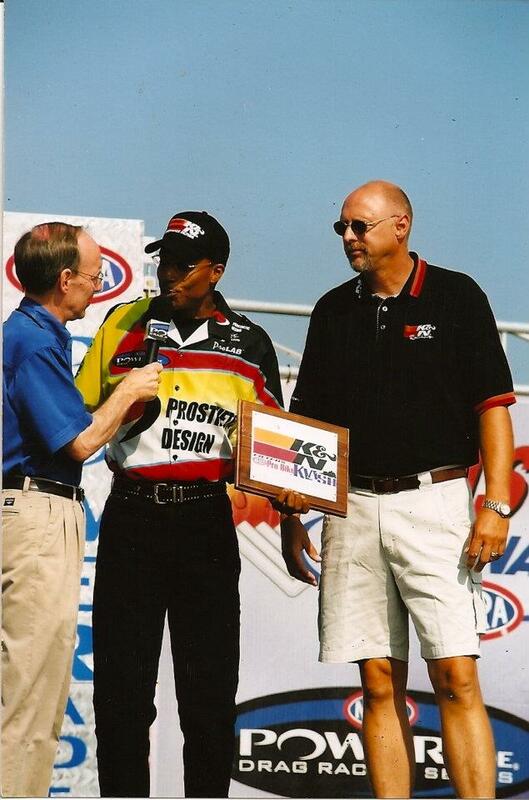 The duo competed together until midway though the 1996 season. Shortly thereafter Showers decided to start his own team. 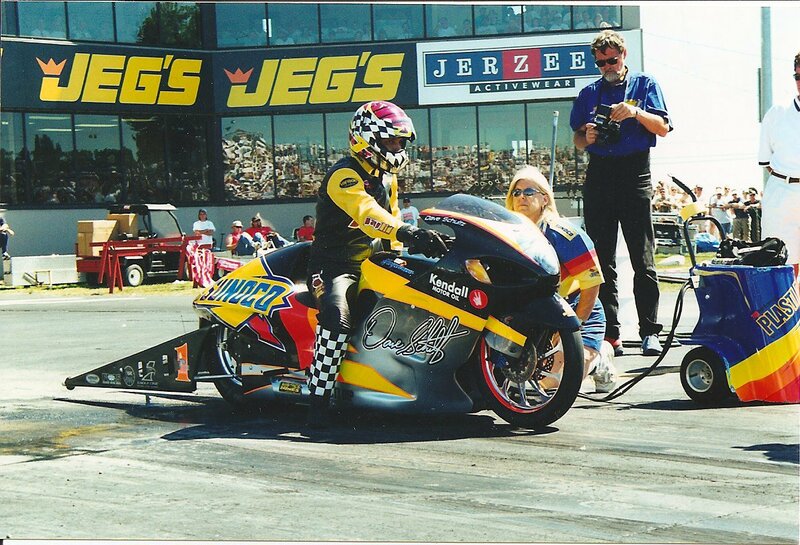 At the time most of the sponsorship money for the Pro Stock Bike category came from dragbike related businesses within the industry. Not only did Showers acquire a non-industry sponsor, he found one that couldn’t have been more fitting to his situation. In 1997 Prosthetic Design Inc., a major manufacturer of components for the disabled, recognized Showers to be a valuable marketing associate and the partnership was formed. “PDI came on board and played a huge role in my success. In large part they are the reason I was able to continue racing,” Showers said. 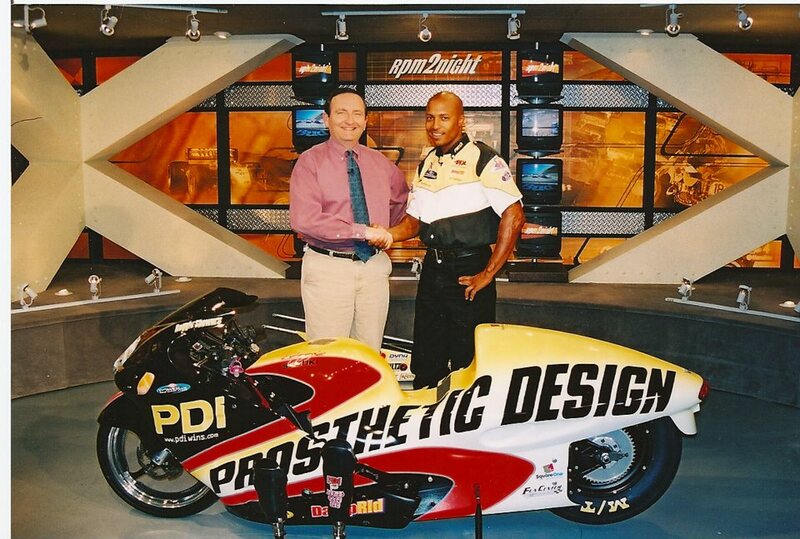 Like most sponsors PDI provided Showers with critical funding to compete in an extremely costly sport. 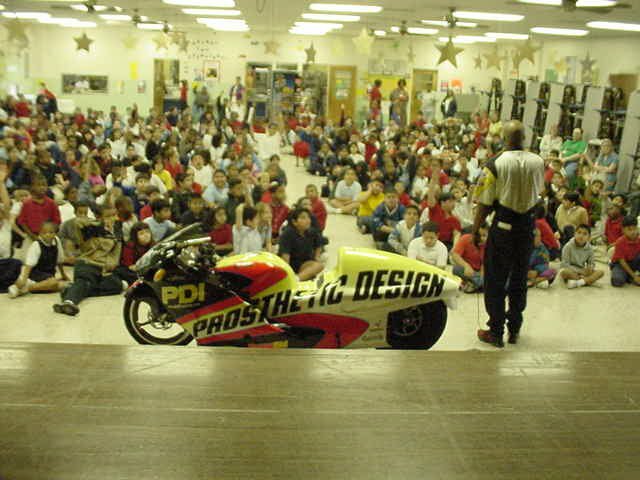 However the unique aspect of this sponsorship is that PDI had taken a much more active role in Showers’ racing by actually getting involved with the race team’s research and development, supplying Showers with specially crafted legs to improve his riding. Showers’ pre race ritual involved changing legs. Showers had one set of legs for walking around and another set developed specifically for racing. Instead of tuning the bike to his disability, Shower’s tuned himself to the bike so precisely that his motorcycle had no out of the ordinary specialty devices to accommodate his disability. Showers’ machine was virtually the same as each of his competitors. 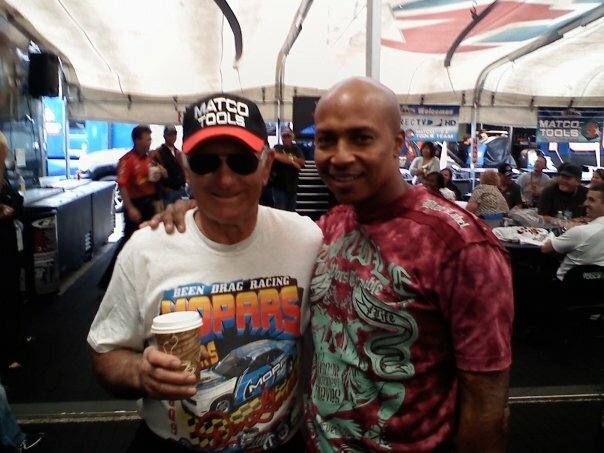 Reggie Showers worked with the legendary George Bryce of Star Racing for many events. 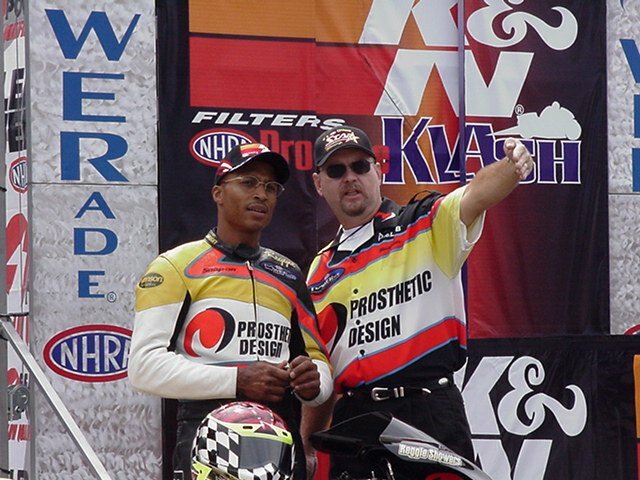 For the 2003 season Showers’ took his program to the next level by hiring George Bryce, a multi-time NHRA champion. Bryce’s in-depth game plan for Showers went as far as putting him on a strict physical training regiment and diet that has caused him to lose more than 15 pounds. Reggie Showers and Antron Brown in the lanes. 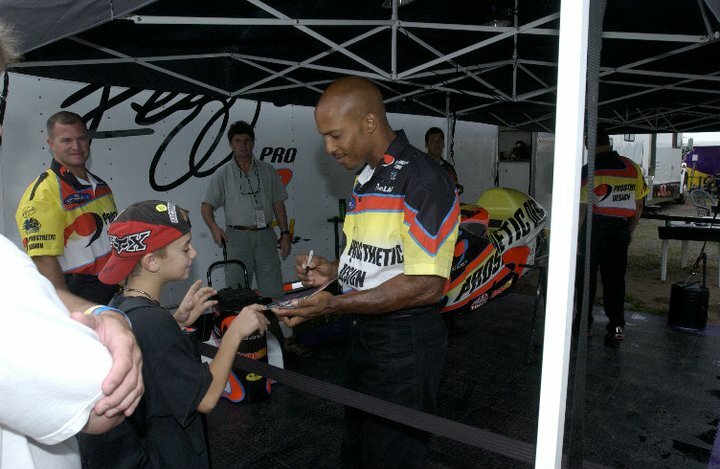 Nearly 20 years after his motorcycle career began, Showers’ fulfilled the unimaginable on September 7th, 2003 by capturing his first national event victory at NHRA’s most illustrious and prestigious race; the Indianapolis U.S. Nationals. Reggie Showers had a lot to say to ESPN after his victory. Several factors made Showers’ first win exceptionally special. First, winning a career first NHRA race at the famed U.S. Nationals is the equivalent of a NASCAR driver winning their first race at the Daytona 500. Showers’ win was quite unlikely considering he qualified eighth in the elite 16-bike elimination field. A mid-pack qualifying effort at the tour’s most sought after event left Showers with some pretty tall orders on race day. Showers responded to the challenging agenda the same way he’s embraced life’s challenges for the last 39 years; one step at a time. 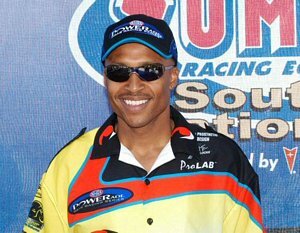 Reggie Showers was sharp on race day. All in the same day Showers defeated the defending champion and pole-sitter Angelle Sampey, as well as the current points leader Geno Scali en route to winning the event. Showers was out motored on two occasions where his competition actually posted a better elapsed time. However in each instance Showers was able to overcome the deficit and reach the finish line first due to better starting-line reaction times. In the final Showers took out Shawn Gann’s quicker but losing 7.23 with his own 7.26 and stellar .021 reaction time. Reggie Showers showing off his infectious smile. Showers’ post race victory celebration was far from the usual spraying of champagne. Showers’ display did just what he intended it to do. It attracted major media attention from the likes of ESPN and USA Today that helped to spread his bold message to hundreds of thousands. For most that message was heard loud and clear. Showers’ proved his success was no fluke by winning the tour’s next race in Memphis, TN. Despite his infatuation with NHRA Pro Stock, Showers has decided to take a break from racing. Showers still makes good use of his time. Reggie Showers spends a lot of time giving motivational speeches. Since losing his legs 35 years ago Showers’ has consistently maintained a positive “never say never” attitude. Showers tries to instill that same type of attitude in children all across the country through his many visitations of schools and hospitals. Three-and-half decades later and Showers still keeps his thoughts in the proper perspective. From showing up at school in the fall of 1978 without the use of crutches or a wheelchair just three months after his accident to winning the prestigious NHRA U.S. Nationals, Showers has succeeded in a trying situation that would have caused many to give up. Reggie Showers paying homage to his late mentor Dave Schultz with a memorial pass on Schultz’s bike. Through his success, Showers is convincing a lot of people he’s right. WHAT’S UP REGGIE?YOU STILL HAVE YOUR VETTES?IF YOU WOULD,EMAIL YOUR CONTACT INFORMATION SO WE CAN MEET UP.ITS BEEN A LONG TIME. You’re so inspiring. Many blessings. Long time no see Reg. Get in touch. my number is still the same. 215 407 5942.